You are currently browsing the category archive for the ‘Of Interest to Writers’ category. Okay, so it’s been a while since I posted. After “Corn Ride” was published in the Summer 2010 Willows Wept Review, Eric Dieterle posted some kind comments concerning the poem. My short story, “Memories of a Joplin Bum,” was published in Fried Chicken and Coffee. Remember Miki, the French artist who lives in Spain? I wrote ekphrasic poems to several of her lovely paintings a few years ago. Well, Miki and her friends have started a site, Eastelspace. com, where poets and artist can meet. I joined at Miki’s invitation. And Miki created a picture, “Helen Losse,” to which I replied with a poem, “Helen Walks In the Mountains.” Scroll down to read the poem. Three of my poems have been published in Poets For Living Waters. And last night I found out my poem, “It should be obvious,” has been nominated by Redheaded Stepchild for a Best of the Net Award. Meanwhile, I’ve submitted Seriously Dangerous for consideration for publication, given thought to the Dead Mule’s nominations for Best of the Net, written a few new poems and submitted a couple. I‘ll be reading from Better With Friends (Rank Stranger Press, 2009) at the Tate Street Coffeehouse in Greensboro, NC next Saturday. So join me (in the open mic), if you can. I’ll also be reading at the East Bay Meeting House in Charleston, SC (Monday Night Blues) on September 27. I’ll have copies of Better With Friends for sale at both locations. And it’s almost time to get back to work accepting more great poetry for the Dead Mule. Next poetry issue goes live October 5. Bye, bye, sabbatical. 🙂 Bring on the fall. I have a review of Collin Kelley’s novel Conquering Venus in A New Book Review. Please visit and leave comments. Lately I ‘ve spent a lot of time networking on Facebook, and my blog statistics reflect my negligence of this blog. So what to do? I like the format here: the ease of posting and the fact that entries can be quite long. But with so many news readers doing the work, people seldom just drop by. On the other hand, short entries on Facebook get responses. No one actually thinks it is important that I bought two containers of the same kind of ice cream (rather than two kinds), but as a result of the comment there was lots of joking with folks I hadn’t talked to since high school. But does it matter? Do I have anything in common with these folks now? Will actual friendships form? As I’ve said before, I began this blog to showcase my writing and the writing of my friends. And I joined Facebook to network with other writers. Along the way, I’ve “met” some great people who I wouldn’t have known except for the internet. People can argue all day about whether or not these are “friendships,” but I have learned form these people just as surely as I learn from a book I read. No one questions my relationship to the author. So why cyber friends? And as to meeting people on the web, I have. A number of writers that I now know in person I first “met” through Facebook or e-mail. Even a couple through a list serve and my blog. One such person is poet Scott Owens of Hickory. I first “met” Scott when I was referred to him as the “Visiting Writer” who could provide student poems for the Dead Mule. Our friendship has grown immensely since that time, and my life is richer because of that friendship. Scott knows how to network, and he shares what (and whom) he knows. I try to return the favor. After all, isn’t friendship about sharing? I think it is. And this week I had a review of Scott’s book The Fractured World published in the August 2009 issue of The Centrifugal Eye. But don’t read only my review. Scott has three poems in this issue. Read them, too. And buy Scott’s book. Last night—thanks to Scott Owens—I read at Poetry Hickory, along with John Amen. I read from my chapbooks Gathering the Broken Pieces and Paper Snowflakes (scroll down) and newer poems from my book manuscript Prayer In the Fog (under consideration but not yet published). I also read a brand new poem, “Captured Light” from a project by the same name that isn’t published anywhere yet. There was a small but appreciative crowd. I was surprised to see Carter Monroe (that’s his pen name) there. He said he’d come to hear me read, but he’d also come to “hang” with Tim Peeler and Ted Pope (only I didn’t know Ted was there until Scott told me). Next month Scott and Tim will be the featured readers. That’s Scott Owens and Tim Peeler – Poetry Hickory at Taste Full Beans Coffeehouse -6:30 pm October 14. 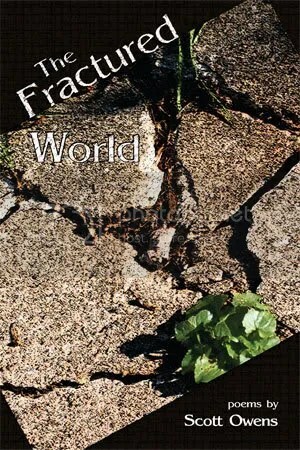 I got a copy of Scott Owens newly published book Fractured World, (scroll down) just out from Main Street Rag and a copy of John Amen’s More of Me Disappears. Also, John’s newest CD Ridiculous Empire. Did I mention John also sang? Very nice. Very talented, multi-styled singer. Easy to listen to but sang songs that had meaning. John Amen is also the editor of Pedestal Magazine. I also met Trisha Hart, another Mule poet. I asked her for more poems. Did I mention all of these poets have been in the Mule? Even me—back in the day, that is, before I became Poetry Editor. Fun, fun night. Thanks to all. There were many mentions of the Dead Mule last night. Mentions of Valerie MacEwan, editor and publisher, and other Mules. You see, “Hammerin’ Hank” had paid his dues. Voted the National League Most Valuable Player in 1957, (only once), Aaron hit 755 home runs during his Major League career. He holds many of baseball’s most distinguished records, including runs batted in (2,297), extra base hits (1,477), total bases (6,856) and most years with 30 or more home runs (15). He is also in the top five for career hits and runs. He had played 23 years as an outfielder for the Milwaukee (later Atlanta) Braves and Milwaukee Brewers (1954–76). For more information about Hank Aaron, read his autobiography, I Had a Hammer: The Hank Aaron Story. Please join me in honoring this fine American during Black History Month and all the time.